Well, the latest from the movie theatre is that I went to watch a night show last Sunday with a group of friends and had to get out within the first 5 minutes, because I fell super ill. It was not the movie, it was the err... "food" I had before the movie. This one stars George Clooney and his backpack. Its about a guy who specialises in traveling to different parts of the country, laying off people on behalf of their employers and in getting laid with a random woman he meets. His aim is to be able to live without any emotional baggage and to earn a million flying miles. He achieves the latter but fails to do much about the former. Decent, but overrated. Extremely slow paced and depressing movie about the advent of Christianity in Roman Egypt, and the seemingly correlated decline of freedom of speech/thought and the destruction of the great library of Alexandria. 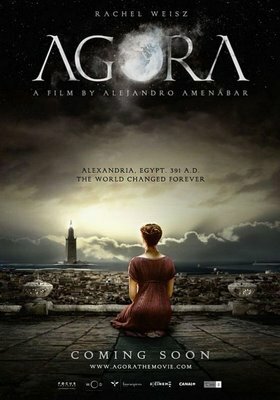 This one is a biopic of Hypatia, one of the greatest female philosophers of all time, or so the movie leads us to believe. Here is what wiki thinks of her. Rachel Weiz plays Hypatia and does a fabulous job! Hypatia is a woman who is oblivious to all advances made at her by admiring men and the religious politics being played around her. Her only interest lies in deciphering ,why the planets move in such an odd manner, could it be that the Earth is after all not the centre around which everything revolves? This is again a movie that is watchable, but only if you are in a certain frame of mind to take the death and destruction. Staring Bugs Bunny, the rest of the Looney Tunes gang and a lost looking Magic Jordan. Okay as a kids movie. But I was not too impressed. Picked this one up because the cover looked good and the movie summary sounded interesting. But it turned out to be a highly overrated, weird black and white 1960's French movie. Something about a Piano player in a small bar who has a troubled past, and gets into deeper trouble when his brother lands up at the bar chased by a couple of goons. Supposedly a thriller, but it was quite weird for my liking. So here is this not so nice guy, played by Dustin Hoffman who reluctantly saves 54 people, including an award winning telivision journalist (Geena Davis), from a plane crash. But the credit and a million dollars go to a homeless Vietnam war veteran, played by Andy Garcia thanks to a case of mistaken identity. Now, the homeless guy is a gem of a person who believes about giving back to society, but is guilt ridden about having lied to get the money. Our hero is trying to save himself from going into jail and spend time with his son. I quite liked this movie, it is a sweet well made movie with the message that there is a hero in everyone of us.